You probably heard of the many benefits that a UV sterilizer can offer for your aquarium. The only problem is that there are too many UV sterilizers to choose from. The truth is a lot can go into picking the perfect UV sterilizer for a fish tank. We’ve got your back though! 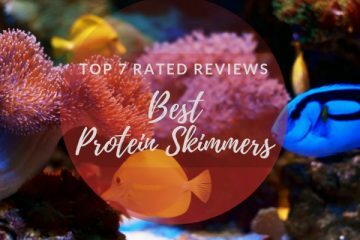 Below, we have listed 7 of the best UV sterilizers for aquariums you can pick from. we go over all the benefits of using the UV sterilizers and what the types of tanks are best for. We will also let you know the pros and cons of each piece of hardware so you can make the best decision. 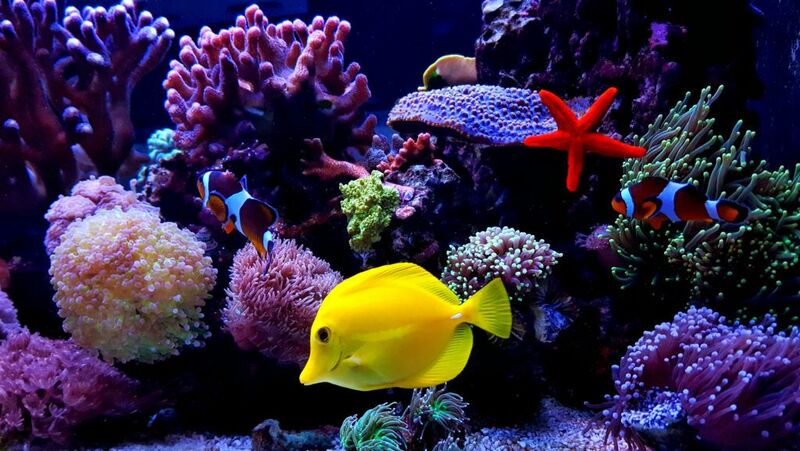 There are several benefits to using a UV sterilizer that may help benefit your aquarium. For starters, it can help make your tank have a healthier environment. It is also a way to clean up algae bloom without having to use additives to your water. By using a UV sterilizer you can eliminate many harmful viruses from your water as well. Many fish owners use UV sterilizers in order to get rid of diseases such as ick. It can be one of the most effective ways to treat several different fish without pouring in medicine. If you have an outside pond then things can be even harder to control. Many pond owners choose to use a UV sterilizer to help keep the development of algae It bay. The sterilizer helps by creates a constant shield against the growth of new plants and kills off ones already in the pond. Many people who use UV sterilizers on tanks that are already been infested notice improvement within a few days. This can work faster when adding chemicals to your water to take out the algae. In fact, UV sterilizers have been known to clean up tanks that even some algae removers can not. Best of all UV sterilizers are a lot safer for fish. UV sterilizers don’t generally change anything about your water. You won’t have to worry about your pH being thrown off balance with a UV sterilizer. They are also easy to install and easy to remove when you no longer need them. UV sterilizers can even make the amount of time you spend trying to clean up your aquarium shorter. While you won’t want to substitute a filter for UV sterilizer, it can help a lot. Many people who use the sterilizers in conjunction with a filter noticed a clear cleaner looking tank. 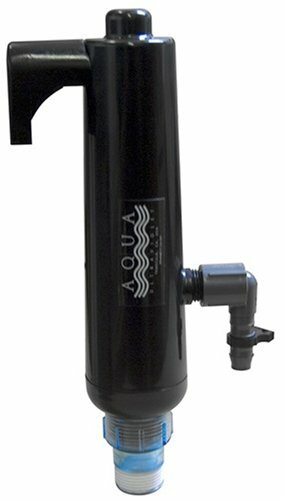 The Aqua UV is a sterilizer that can help with eliminating bacteria in several different environments. The sterilizer is 12.5″ x 5.5″ x 2.75″. In order for this sterilizer to operate properly remember to only use it only in bodies of water that are appropriate for this sterilizers size. The particular sterilize is good for between 200 gallons of water to 300 gallons of water. Anything more than this and the sterilizer won’t do its job properly. 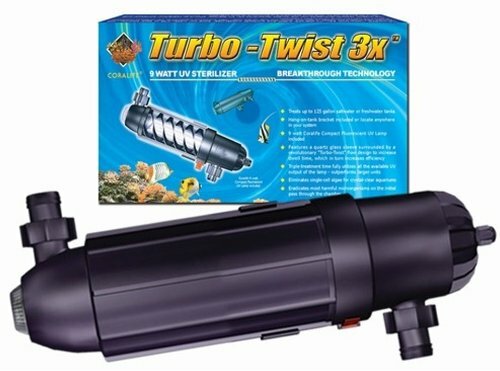 If you have a saltwater aquarium then this product is appropriate for up to 75 gallons of a saltwater environment. This model can even be used outside to help safely maintain the bacteria levels on a small pond. This can help eliminate any unhealthy viruses that have decided to try and invade your fish’s habitat as well. This sterilizer is so powerful it can even reduce algae within a few days. You should note that your hose probably won’t fit perfectly to this unit. You can fix this by going out and buying a clamp. In this situation, it is recommended that you use a metal clamp in order to guarantee you won’t have a leak in your system. You should also note that if your water starts to get low the return will create a waterfall sound. While many people may enjoy this noise for others it can be an annoying racket. This unit is completely made in the USA. The AA Aquarium Green Killing Machine 9 Watt is one of the number one selling filters in the USA. The UV unit is 16 x 10 x 14 inches and goes inside of your tank instead of on the outside like some other models. This unit works great for getting rid of algae fast and will give you clarity. This unit is designed for use on up to a 50-gallon aquarium, anything over this and the sterilizer will lose its overall effectiveness. This unit is easy to install as well and come with clear instructions on how to safely and appropriately attach your new hardware to your tank. 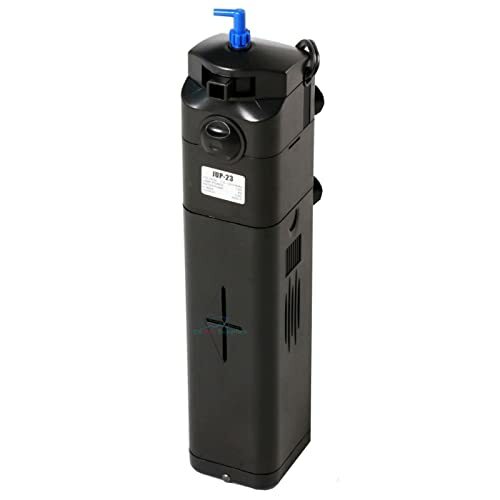 This unit comes with a powerhead included as well, this pump is rated for 220 liters an hour for great cleaning action. You will also receive 4 sponges to use as a pre-filter and get out some of the bigger debris bothering your tank. All in all, this is a great kit for a great value. This model also contains patented technology that is proven safe for your fish. No having to worry about the effects of this UV sterilizer on your tank. This kit also comes with a 3-year warranty attached, if you have any issues at all just contact the company to get a replacement sent. Finally, there are some downsides to this UV sterilizer that you should know about. For starters, it seems this line of UV sterilizers may have a faulty motor that goes out after two months. The UV sterilizer is also sealed so that you can’t touch the bulb, this means that you can’t replace it either. 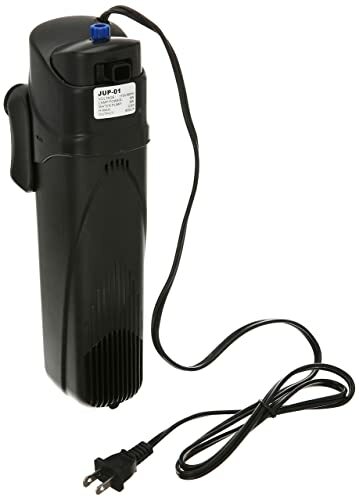 The SunSun JUP-01 9W UV Sterilizer Submersible Filter Pump is a great addition to any tank that is in need of a little algae or bacteria eliminating boost. This unit is 12″ L X 3.3″ W X 3.75″ H and goes inside of the tank under the water instead of on the outside of your aquarium. 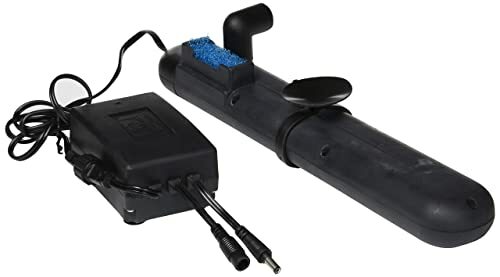 This unit works for up to a 175-gallon freshwater tank making it perfect for smaller aquariums that may not need an ultra-powerful UV system in them. The UV bulb itself is 9 watts and it’s not recommended to try and change out this model to use to use a higher wattage bulb. This units pump has a flow rate of 210 gallons of water per hour. That means it may be a little bit strong for some calmer or smaller breeds of fish. This particular unit also doesn’t come with any instruction as it comes put together and ready to add into your tank straight out of the box. The box also includes an easy to use suction cup for attaching the unit easily to the side of your tank. Also, be aware that you will get a pre-filter sponge in the package to help you filter out the debris. The manufacturer does recommend changing the bulb at least once a year. This unit can also work in small ponds, but you should take care to make sure it stays clean regularly. If the unit gets too clogged or left out in inclement weather then it can easily become damaged. Take care to only use this unit outside in small bursts or in good weather. The Aqua Ultraviolet 25-watt UV Sterilizer for Aquarium is a great choice for both indoor or outdoor use. This unit can be used on a large amount of water making it perfect for use on scenic ponds. This is especially great if you have a large amount of koi or goldfish outside. The massive 25- watt bulb can take care of up to 1,200 gallons of fresh water. This model will also work on saltwater tanks and can filter up to 150 gallons of saltwater without a problem. Even better this unit is made out of tough plastic that won’t break easy no matter the environment. This unit comes with instructions that make it a breeze to install no matter your level of aquarium expertise. This UV sterilizer is 20 Inches long x 3-3/4 Inches wide x 6 Inches high. With an incredibly long sterilizer life of around 14 months making each bulb last for over a year. This unit has been noted to work fast even on larger outdoors ponds. The unit can clean up your water within 4 days time to give you back a crystal clear view. Even better, this sterilizer will come with a 1-year factory warranty that will cover you in case any possible defects pop up. With all of this being said, there are still some downsides to owning this particular UV sterilizer. For starters, the UV bulb can be a little hard to replace at times making maintenance a hassle. Other than this small issue though this unit is a pure dream to have in your tank or pond. The AA Aquarium Green Killing Machine 24 Watt is a great choice for larger aquariums that need a little bit of UV love. This filter can be used both inside and outside to meet all of your aquatic needs. This model is also built to withstand some inclement weather types. This is one of the number one selling aquarium UV sterilizers in the USA. It is 16 x 10 x 14 inches making it not to big or bulky for your indoor tank. The bulb is 24 watts and should not be swapped out for a higher or a lower wattage to keep the system’s effectiveness. This aquarium UV sterilizer can handle cleaning up to 120 gallons of fresh water. The pump rate is 440 liters of water an hour. This may be a little strong for some fish but for others will work perfectly fine. This sterilizer will have your tanks water clear in a matter of days. The UV sterilizer also has a super simple setup, the instructions for the UV like make set-up it easy to understand how to install it to your aquarium. All in all, it would take around 10 minutes to have this sterilizer set up properly. This unit also comes with a 3-year warranty to protect you. There are some downsides to this sterilizer as well. This UV setup can cause fluctuations in the temperature of your tank. You may also experience a drop in pressure in the water that is released back into your aquarium. 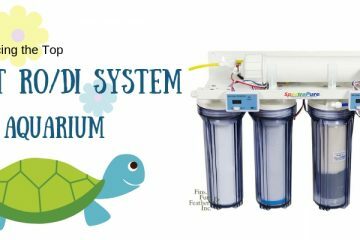 The Sun 13W UV Sterilizer Adjustable Pump Filter is the perfect filter for your indoor Aquarium. This UV sterilizer is best used for indoor tanks since it may not take the outside elements well. 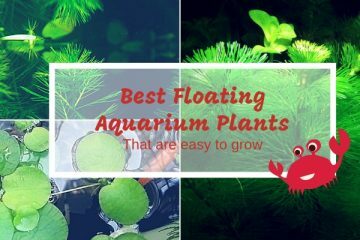 The company also states that this can be used in either freshwater or saltwater aquariums. The dimensions of this slide are 3″ x 2.5″ x 13.5″ (H), making it the perfect size to fit inside your tank. This sterilizer will be best for a tank between 40 to 75 gallons of water. If you have a saltwater aquarium you may want to go with the lesser of the two for the most effectiveness. This UV sterilizer also comes with a pump. This pump is built-in and runs off of 8 watts. You will also be glad to know that this model has an adjustable water flow regulating nozzle. 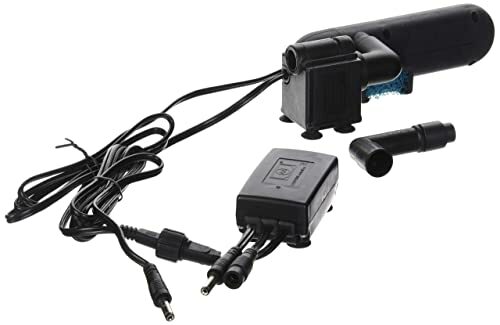 This can help you control the flow of water going back into your tank from the pump. This is one of the best UV sterilizers for your aquarium and can give you clear water in a matter of days. Just be sure to regularly check on the water flow the sterilizer is putting out to adjust it for your tank. You can do this simply by putting your hand in to determine the flows strength. There are some downsides to this sterilizer as well. The motor on the pump can be prone to freezing up on some units. The instructions included with the UV sterilizer also aren’t that great and can be hard to read at times. This UV sterilizer is 10.6 x 2.9 x 4.1 inches and can clip on to the side of your tank. The package even includes clips to use to properly secure the UV sterilizer. This model can work with up to 125 gallons of freshwater and around 50 to 70 gallons of saltwater. This sterilizer is rather easy to set-up and won’t give you any problems. Simply follow the instructions and securely attach the unit to the tank. Once it’s installed just turn on the Coralife Sterilizer and give it come time to work its magic. This model does have a few downsides that you should consider as well. These sterilizers don’t seem to last for years and can burn out fast. There is also a lack of customer support behind the product that makes getting help with issues frustrating. Now that you’ve read about the great brands above you’re probably starting to decide which UV sterilizer you want. There are a few things you should consider when you go to pick out which UV sterilizer to use. 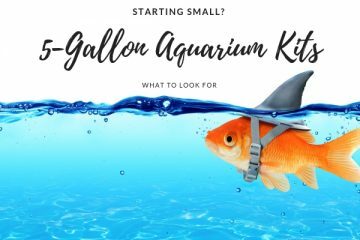 Some very small things can affect just how effective the sterilizer will be in your aquarium.To Begin with, do you have a freshwater or saltwater aquarium? Depending on what type of water you have in your aquarium will affect how effective the sterilizer is. Freshwater aquariums are easier to use UV sterilizers. Saltwater aquariums, on the other hand, can be trickier to use the sterilizers on.This is because in order for your UV sterilizer to work it has to be able to easily penetrate the water. Water with salt in it is harder to penetrate than pure fresh water. If you intend on using a sterilizer in a freshwater setup make sure it is weaker. If you want to use it in a saltwater setup make sure it has a stronger sterilizer. 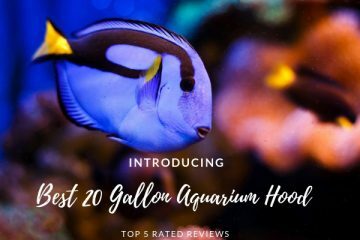 You also want to think about just how big your aquarium is. The more gallons of water that are in your tank the stronger of a sterilizer you need. If you get a sterilizer that isn’t rated for the number of gallons in your aquarium it won’t work. It’s better to be stronger than weaker in this case with UV sterilizers.if you’re trying to get this sterilizer for an outside pond there’s going to be even more things to consider. Some UV sterilizes aren’t designed to withstand the weather. Even if they are designed to withstand outside weather and they may not do good in a storm. You need to look at the materials the sterilizer is made out of. If the sterilizer seems made out of cheap plastic or another material that won’t hold up well you want to skip out. You’re going to need a more rugged material or hard plastic in order to leave the UV sterilizer outside with fish. If a description doesn’t mention the sterilizers for pond use you might want to skip out as well. Next, you want to pick a UV sterilizer that won’t clog easily. There’s going to be more debris in a pond than in an inside tank. If your sterilizer ends up getting clogged too easily then it’s not going to do its job to clean. If it does hold up well against debris make sure to clean it regularly to keep things flowing right. Finally, there are some pointers you should use when using UV sterilizer. You’re not going to need to keep the UV sterilizer on all the time if your tanks clear. It’s best to run a UV sterilizer 1 to 2 hours a day to keep the growth down. UV sterilizers aren’t a cure-all if your fish is sick, you need to use medicine as well. You will also want to have a filter running with your UV sterilizer. A filter is an important part of keeping algae growth down and good bacteria in your tank. Without this, your tank will continue to go through some of the same issues as when you first hooked up the UV sterilizer. Now that we’ve gone over everything you need to know about UV sterilizers for fish tanks, let’s make a decision. 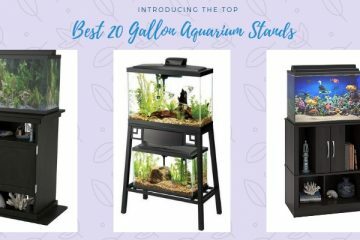 These are some of the best UV sterilizers for aquariums that you can buy. Just match up which sterilizer will work best for your tank size and water type.